Northside College Prep's 2018 Reach for the Stars Gala to benefit the NCP community. Join us for a festive evening of food and drink to benefit NCP under the beautiful Tiffany Dome in Preston Bradley Hall at the Chicago Cultural Center! Please consider a sponsorship package! 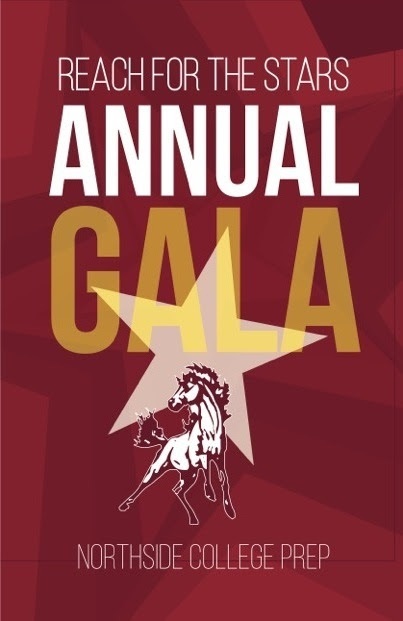 All sponsors are invited to a reception with Northside administrators from 6:30 to 7:00 p.m. Sponsorships are critical to making the Gala a financial success. Platinum Sponsor: $1,200. Includes two individual tickets, two sponsored teacher tickets, sponsor reception, online recognition at friendsofnorthside.org, and recognition at the Gala. Gold Sponsor: $600. Includes two individual tickets, one sponsored teacher ticket, sponsor reception, and online recognition at friendsofnorthside.org. Silver Sponsor: $300. Includes two individual tickets, sponsor reception, and online recognition at friendsofnorthside.org. WHEN PURCHASING SPONSORSHIPS, PLEASE REGISTER NAMES OF BOTH PERSONS ATTENDING. Please DO NOT register or enter teacher names or you will be charged for additional tickets; sponsored teacher tickets will be distributed separately. All Gala tickets include a dinner buffet and complimentary bar featuring beer from Lagunitas Brewing Company and specialty craft cocktails, provided by Crafthouse Cocktails. Enjoy music by sophomore parent Matt Farmer. Please note, "tickets" must be purchased in advance; all attendee names will be on a check-in list at the door. Ready to reserve your spot? Click HERE or on the blue Registration bar above. Send us an email if you have any questions about registration.